Opened on 1 March 1930, The Majestic Theatre was built for John Fuller & Sons. 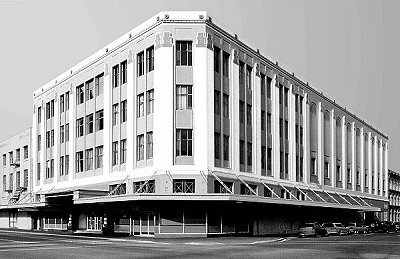 Billed as ‘The Showplace of Christchurch’, the Art Deco building contained three upper floors of offices, known as Majestic House. It is Christchurch’s first fully steel-framed building. The building is a Group 2 scheduled heritage building, of ‘national or regional significance’. This landmark building in Christchurch’s central city is to be demolished. More than 235 listed heritage buildings have been demolished in Christchurch city and suburbs and in Lyttelton over the three years since the earthquake emergency. Heritage buildings are still being demolished by CERA: citizens still have no recourse to the RMA process in defence of a demolition such as this. Sited on the corner of Manchester and Lichfield Streets, The Majestic is a key building with a rich history in cinema, performing arts and Christian worship. It is now one of the few surviving twentieth-century heritage buildings in the CBD. CERA compulsorily acquired the building, have issued a Section 38 full demolition notice, and have begun the early stages of demolition. Earthquake damage is said to be moderate and repairable. Demolition is primarily for the land needed for the CERA-CCDU plan for the 9 metre widening of Manchester Street and as part of the eastern frame. There is strong support in arts, heritage and business communities for retention. The building would be ideal for future use in the east frame urban living zone and Innovation Precinct. In December 2013 the Christchurch City Council vowed to help save the historic theatre and agreed the council should meet with CERA to emphasise the importance of retaining it. Historic Places Canterbury wanted the City Council to seek a moratorium on the demolition while a thorough engineering assessment was done. Marches and rallies in protest at the demolition have been small but vociferous: many Christchurch people who would support retention of The Majestic are ‘exhausted’ living in post-earthquake Christchurch.